KettlePizza Weber Grill Insert Review: Backyard Chef Makes Authentic Neapolitan Pizza! 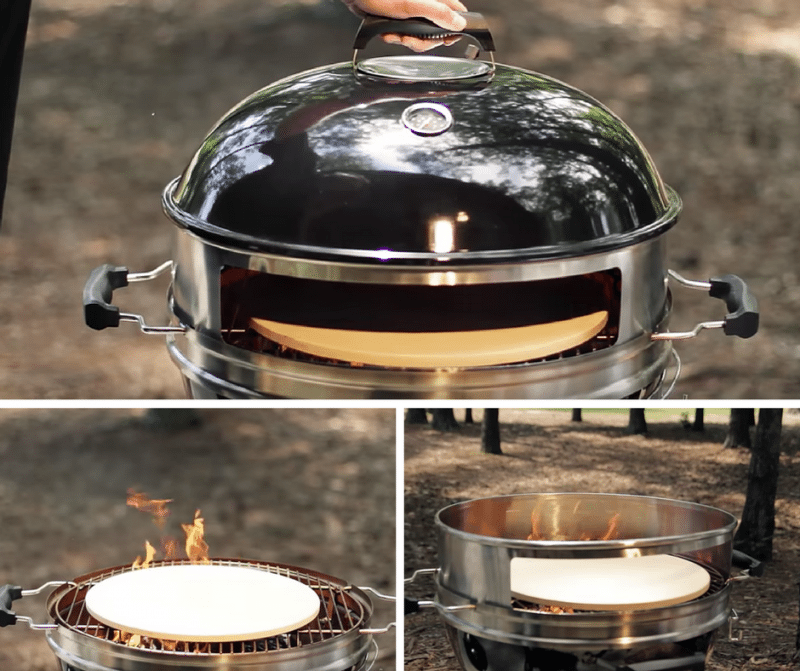 Luckily, a genius little company called KettlePizza started making grilling accessories so that you could make restaurant-quality pizza in your backyard for cheap, with some very basic accessories that work with your current grill. KettlePizza, named after the kettle-style grill it works with, is top dog in the backyard pizza oven space. They make quite a few different accessories at this point, but I wanted to start of my reviewing their flagship product, the KettlePizza charcoal grill insert. Note: Although there are other brands of kettle style charcoal grills out there, I highly recommend using a Weber. KettlePizza was designed to work with this specific size and shape. It may work with other brands, but I've never actually seen anyone do this. I was surprised at how small it was when it arrived in the mail. The shipping box is only 15″ x 15″. Keep this box for when you decide to store your KettlePizza for the winter. Depending on where you live and the size of your garage, it may be difficult to find space for a 22.5 inch, round thing. I just leave my grill outside because I'm in California, so it doesn't snow at all, or rain much in the winter. However, I don't want to leave my KettlePizza outside all year long! 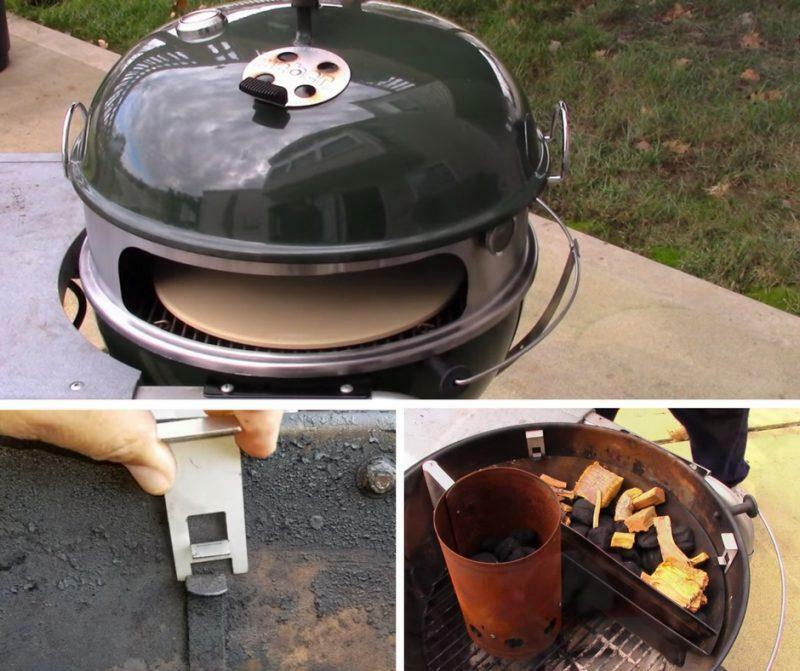 Essentially what you're doing with the KettlePizza insert is making an alteration to your charcoal grill so that it can get up to a higher temperature. 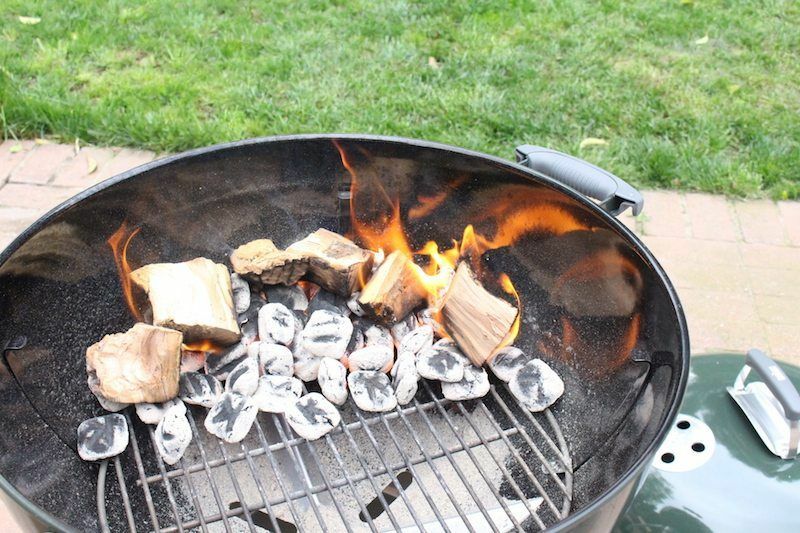 Normally, using just charcoal, your grill will cook at between 300ºF – 500ºF. While this can cook a pizza in about 20 minutes, it's not “Neapolitan style” cooking that you get with a wood-fired pizza oven. Not only that, you only get charcoal smoke, instead of wood smoke, which is what's going to flavor the dough as we cook. A wood fired oven gets up to 1,000ºF, although a good cooking range is anywhere between 700º-1000. First, with the opening in the front of the grill, it means we don't have to take the lid off the grill so we never lose heat. Second, because we're using wood and getting flames, we are going to burn at a hotter temperature. 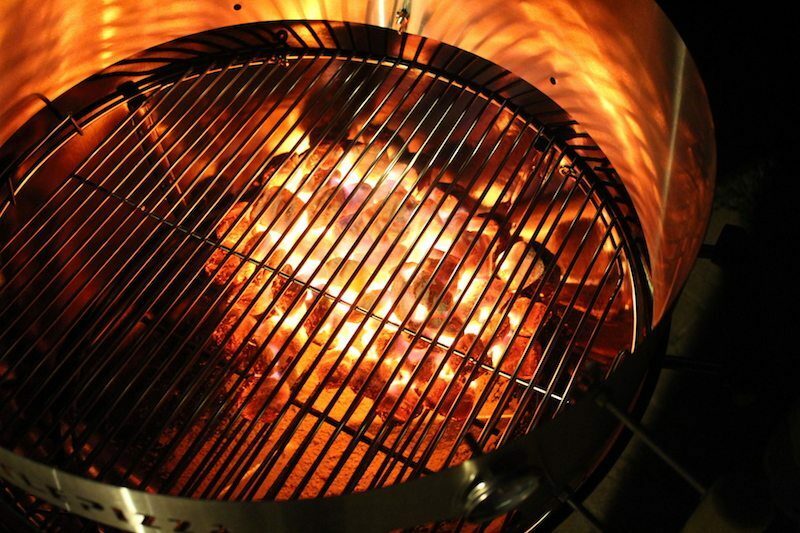 Our coals and wood are at the back of the grill, making the back hotter than the front, which also contains the opening. This is going to give us nice air flow over the pizza, mimicking an actual wood fired pizza oven! With a pizza stone sitting on the grill grates, there's not a whole lot of difference between a hundred-dollar grill accessory and a six-thousand-dollar construction project. I know for country people, you usually have a pile of wood somewhere from a tree you cut down, or know someone that can sell you a box of wood. For city-folk like myself, you can buy chunks of wood at Lowe's, Home Depot, or Amazon. It costs between $5 – $10 for 5 lbs depending on the type of wood you get. Applewood is kind of expensive, but the only other one available was hickory. I tend to avoid hickory and mesquite because the flavor can be quite pungent. Other good options are cherry, pecan, or maple. Get chunks, not chips or pellets! The chips will burn up way too quickly. The pellets will just smolder and not cause any heat. Once downside to cooking pizza this way is that you end up using a lot of fuel. I used about 2.5 lbs of wood and a couple pounds of coal to cook just 3 pizzas. Of course, I was learning how to use the KettlePizza insert, so was making mistakes along the way, so take that into consideration as well. But even if you're working efficiently, you may end up spending about $10 on fuel to cook up a couple pizzas. That, of course, depends on where you're getting your coal and wood! Even with expensive fuel, it's still cheaper than a $20 artisan pizza (plus tip) in hipstertown! Including ingredients and fuel, it probably cost me about $5 to make a pizza, and I am confident I could cut that down with practice. Video: KettlePizza Charcoal Tested & Reviewed! I had a tough time learning how to use the KettlePizza Weber grill insert. Yup. I'll admit it. My first pies were not a success. Actually, the first time I used it I couldn't even cook them because I put it together wrong. The grilling grates go INSIDE the KettlePizza, not inside the grill. See my mistake in the image below? The grilling grates are sitting below the KettlePizza, meaning that I was unable to get the pizza in and out without angling the pizza peel. The grate sits on the wingnuts of the insert. Oops. Not only that, but I didn't know I need to use wood to get the temperature high enough. Oops x2. Once I figured that out, it was time for round 2. The next day was slightly better, but still had some mishaps. Make sure your dough has enough flour or it will stick to your pizza peel! Make sure you know how far back the pizza stone is. I missed it a couple times! Other than that, my main recurring mistake is overestimating how long the temperature lasts. Load up your grill with enough coal and wood to get that sucker hot. Don't be shy. In fact, I recommend getting a charcoal basket to hold your coal & wood. 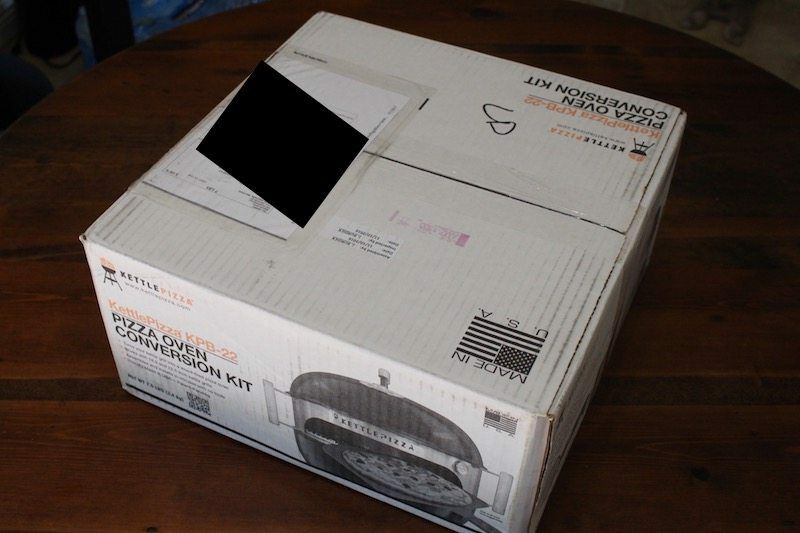 Or, if you plan on spending some dough to get your pizza perfect, consider the Prograte + Tombstone Combustion Kit below. It comes with a bigger pizza stone, and a charcoal basket in one. That'll solve two of the problems I had getting started right out of the gate! The dough here is looking a little pale – not quite like a true Neapolitan wood-fired pizza, but it was my fault. I was cooking at too low of a temperature. I was losing heat and ran out of wood! Still tasted great though. After about 5-6 pizzas I started to get the hang of things. Don't get me wrong – I ate all of the pizzas I made. They were delicious! But they weren't “restaurant quality”, which is what I'm aiming for. I'll update with more photos after I start producing some more photogenic pies. Actually, I found that working with the KettlePizza Gas Pro was much easier. I just tossed the device on my gas grill, and was cooking amazing pizzas in minutes. They don't have that same wood-smoke flavor, but they are still delicious. I may experiment with KettlePizza's gas grill smoker device at a later date. It was interesting to find out exactly how the KettlePizza Weber grill insert could work with both 18.5 and 22.5 inch charcoal grills. The design was simple! Using wing nuts and bolts, you just choose which holes to bolt together, like rolling a newspaper on itself. They actually sell an extension plate on their website for 26.75 inch grills as well. The temperature dial for the grill insert goes up to 700ºF but I've read online about people using an infrared thermometer that read almost 1000º (with the baking steel accessory). Keep in mind the back of the grill will be way hotter since that's where the flames are. The front of the insert, which has the opening, is where the temperature dial is located. One feature of the KettlePizza brand Weber grill insert that no other brands haas is wooden handles! I actually found this very useful for refueling. I was able to move the stone with my tongs, then turn the insert around, open up the grate, drop in some coal and wood, then reverse to get the pizza cooker back in order. Although this is a minor detail, I also just prefer the design of this brand. It's a lot more professional looking, with the cool brand name etched into the front of the device. One other thing to consider is how many more options you have with KettlePizza. As you'll see in the very bottom section of this review, there are a lot of upgrades available with this brand. This is not just a “one off” product from a company that makes a lot of other things. This is their focus, so they do it 110%. Potential upgrades include a made-for-charcoal grills extra-large pizza stone, a steel cap (baking steel) which helps you get even hotter temperatures for more authentic pizza cooking, and handy pizza turners. Plus, all their products are made in the USA, which means high quality craftsmanship and supporting your local economy. This brand is a bit more expensive than other competitors, but in my opinion you get the quality that you pay for! PizzaCraft PizzaQue is really the only true “competition” for KettlePizza. Although I definitely prefer the KettlePizza, there still are some advantages to going with this alternative brand. Most importantly, the price. It's significantly cheaper than KettlePizza – a little more than 1/2 the cost if you compare a similar kit which includes the peel and stone. The kit also comes with a “charcoal fence” that you can see in the image below. 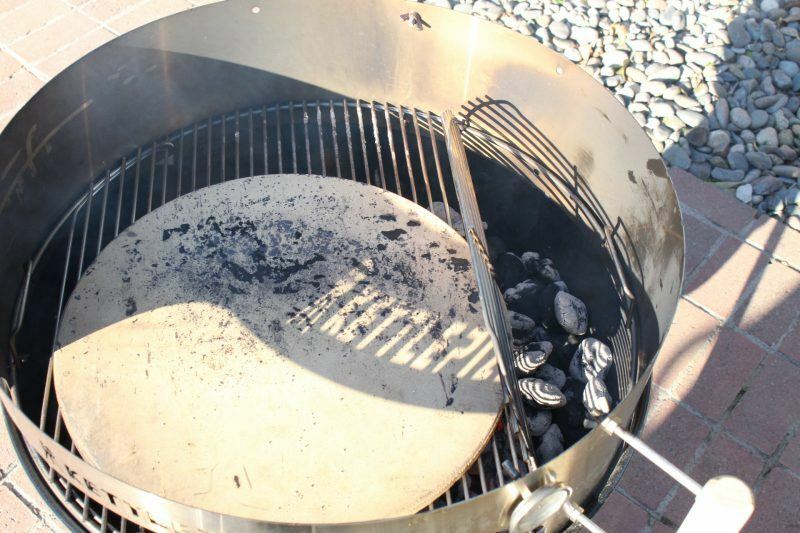 It helps you spread the charcoal and wood around the entire grill without dumping it right in the center which would risk cracking your pizza stone and burning the crust of your pizza. However, I'm not completely sold on the design. Those clips sitting on the outside of the grill do not look as nice as the KettlePizza look. Plus, those brackets that hold your pizza stone up do not look very sturdy. If you accidentally push the stone too far back, could it tip your pizza into the coals? I'd rather be working on a full grate, or more preferably the tombstone (see below). I just bought this a few days ago so will text it next week for an official opinion, and will update with a link when I do! 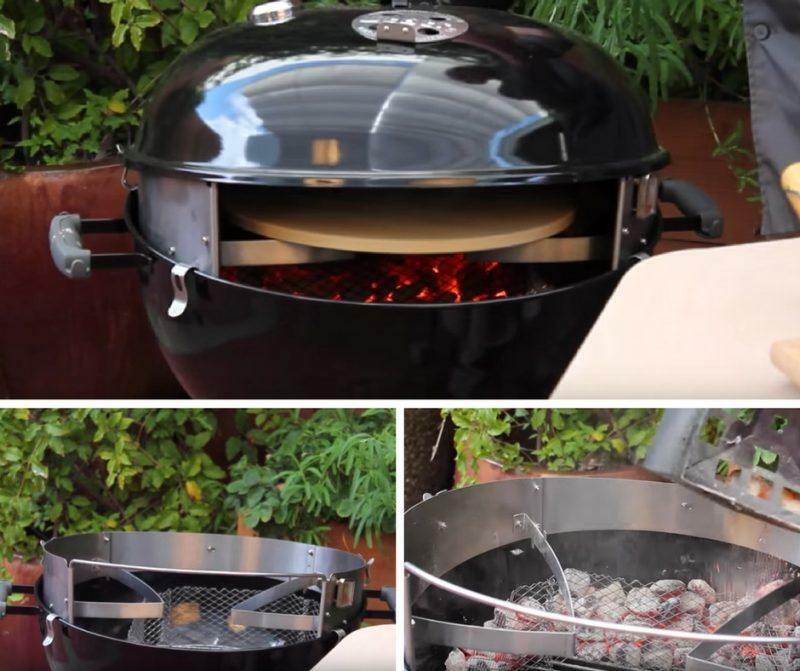 OnlyFire is another brand that makes a pizza oven accessory for kettle charcoal grills. You can see in the image below that the design is a little different, but the basic concept is the same. One interesting feature is that the kit sits on the outside of the grill instead of on the inside (see the metal ring?). A major design flaw raised a number of complaints in the early days of OnlyFire. The grill grate sat below the opening, meaning it was hard to get the pizzas in and out of the oven. Since then, they've introduced “chips” that come with your kit. Place these in the grill and they'll raise the height of your grilling grates. Honestly, I'm not looking forward to keeping track of these. Plus, the PizzaCraft PizzaQue is still cheaper (by a little bit), so if I'm looking for a different brand other than KettlePizza, I'll stick with PizzaCraft. This is an interesting product in that you cannot buy the pizza accessory separately – it comes an an entire grill package! The advantage here, obviously, is that everything comes in one. You get the grill, the grilling rack, and the pizza accessory all in one. It's a more expensive than the other options here, but comes with the grill. You also get a pizza stone and pizza peel in the package, so in all, it's a pretty good price. The downside to this product is that it comes in a lot of pieces! On top of the grill, you have a metal ring that sits on the grill, a separate rack, then the pizza ring on top of that. Plus, to refuel, you have to take everything apart. Who Is The KettlePizza Weber Grill Insert Best For? If you love outdoor grilling and want to try your hand at making some delicious pizzas at your next barbecue event, then the KettlePizza Weber grill insert would be perfect for you. Everyone loves pizza, and everyone will be really surprised that there's such an interesting product out there. I'll be you inspire some of the other people to buy their own as well! If you have kids and want to teach them about cooking, or just spend some time outdoors, this is a really good project to have. You can take your pizza grill camping, tailgating, or even just stay in your backyard and enjoy being outside instead of stuck in front of the TV while a pizza cooks in the oven. Or, if you're like me, just a dude that likes making creative food, this is a lot of fun to play with. I've made some awesome creations so far, including a spicy bacon pineapple pizza, a brie + fig jam pizza, and basil chicken pasilla pepper pizza that were amazing. There's nothing better than impressing your girlfriend with a homemade, fresh, hot, wood-fired pizza with her favorite toppings! This was a great buy. I'm having a lot of fun with it, and it's only April. 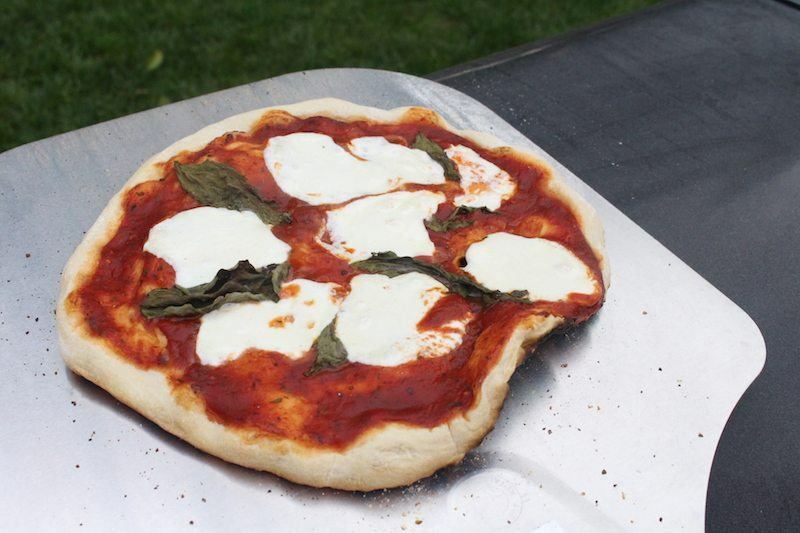 As summer comes around and my pizza skills are more in order, I'm going to be impressing some of my friends. I also make my own beer, so the party is at my house this year. That being said, if you're in a pinch for time, the Gas Pro is a lot faster to get set up and cooking. I'm working on a comparison between the two KettlePizza products and will post a link when its done. Both are great! ==> Get The KettlePizza Insert Here! You're still saving a ton of money by not building or buying a proper wood-fired pizza oven. Even with all of the upgrades listed here, you'll still spend less than $500 for a legit wood-fired pizza oven. Your oven will reach 800º-1000ºF and have smoky wood flavor. Plus, yours will be better because it's portable. It's a portable pizza oven. You can take it with you if you move, or even if you just want to take it to a friends house or tailgating. Compare that to building or buying your own oven. It will improve your pizza making experience. Pizza is fun, until you're struggling to get a floppy, sticky dough off your pizza peel. These make it easier, which makes pizza-making more fun. They'll last forever. Everything here is stainless steel, high quality, and made in the USA. Plan on using this gear for the next decade, it'll pay dividends in chewy crust and gooey cheese. It's not just spending money, it's investing in your culinary skills, investing in your family and friends, and investing in happiness. Note: Regarding the pricing of Amazon, I can't post the exact price here for two reasons. One, the price fluctuates depending on the exact seller, as well as fluctuations in the Amazon Marketplace. Even a price change of less than $1 would be unfair to you and the seller. Plus, it's against Amazon's TOS to post an exact price. However, I will note that in some cases, the Amazon price is cheaper than KettlePizza. In other cases, the opposite is true. My recommendation is to pick one place to order everything. Many of the KettlePizza accessories do not have Prime Shipping on Amazon, but some do. This may change in the future, so check! This is the upgrade that I'm gunning for. I haven't got it yet – too busy testing other pizza stuff right now, but I think this is really going to up my pizza game. It's a grill grate made especially for the KettlePizza insert. There are no actual “grates” though, because you don't need them to cook the pizza. It's an extra large pizza stone in the shape of a tombstone, with a basket in the back to put your charcoal and wood. That keeps the fuel to a nice spot in the back so the stuff doesn't fall in the center of the grill beneath the stone, potentially cracking it or burning your dough. This is a very cool accessory, but I'm having a hard time pulling the trigger just yet. Technically, it's made so that you can bake your pizza and grill stuff on the top at the same time. But what it also does is it makes the heating chamber smaller, meaning you get your grill up to pizza temperature faster, and you can also get the temperatures hotter. That means more authentic Neapolitan style pizza. A very cheap accessory that will just make your life easier. Sure, you can get out your peel and shimmy your pizza 180º, or remove the pizza completely, turn it with your fingers, then reinsert. 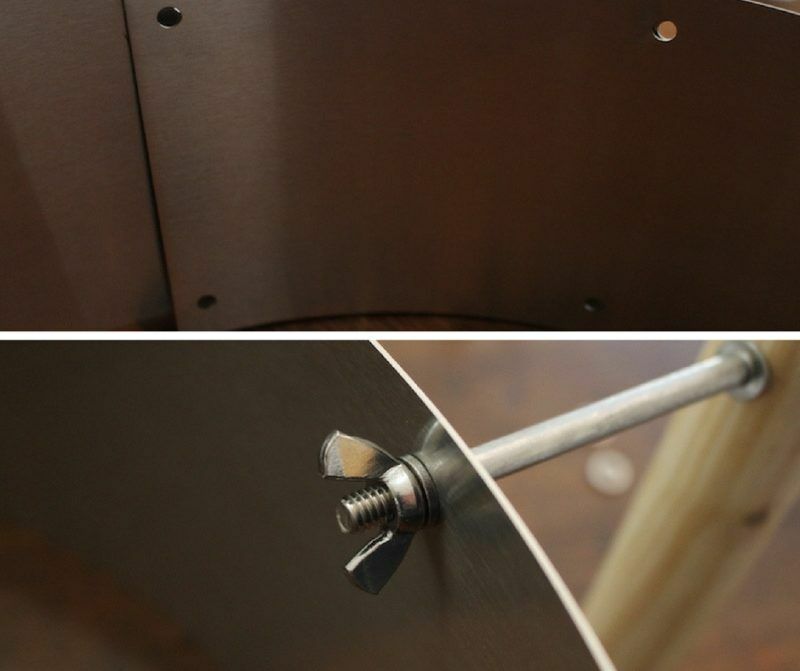 But it's a lot more efficient to just use these two long metal spinners to turn the pizza inside the kettle. You lose less heat, and waste less of your time. You are here: Home / Outdoor Cooking / KettlePizza Weber Grill Insert Review: Backyard Chef Makes Authentic Neapolitan Pizza! I had never heard of cooking pizza in a grill before arriving to your review. Really interested in getting one of them myself, even though I have a big wood oven, it can be very unpractical on occasions. I would love to try and make some pizza on that one. I am probably getting one for summer and the KettlePizza seems to be the right one. Great review and a really interesting product I never knew existed. Did you have trouble managing the temperature to stay at the correct level? I find that to be the main trouble for me when making pizza. This looks like a great culinary tool! I’d love to get one except for the fact that I’d worry about what recipes to make so ensure that the dough and toppings are cooked all the way though. I’ve never cooked at such a high temperature before and worry that my regular pizza recipe would burn on the outside and be raw on the inside. Do you have any recipes to share? I’m working on some pizza recipes right now! I’ll update this post when I get some links up. Great review! Thanks for adding so many pictures – that really helps. I had never heard of this product either. Very interesting! I think the thing that would keep me from buying it though is the amount of fuel it takes. That’s a lot! But if I did get one, I agree with Lindsey about needing the right recipe. Do they include recipe tips at all when you buy it? But once I get my recipes up, I’ll post some links. 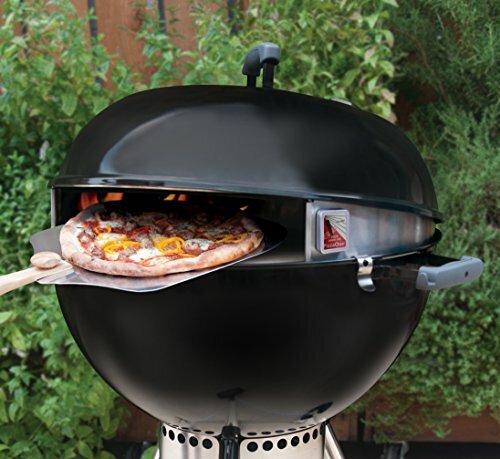 This is an AWESOME weber grill and I did not know they made this particular one related to Pizza. Thank you for posting this product and I will share it with my friends and family because we have a lot of Pizza lovers. The pizza on your Post looks incredible and makes my mouth water. I want to go out and buy this Weber grill right now. Or at least consider buying via your Post and just using Amazon where we often shop. thanks again! The Weber grill is actually just a standard grill. The KettlePizza insert is bought separately and made to fit into the grill, either 18.5 inch or 22.5 inch! One of the coolest things about the kettle pizza insert by weber is that I didn’t even know it existed. Now, not only do I know it exists, but I have enough information on the product to make an informed purchase. Who doesn’t love pizza? and during the hot summer months I prefer to cook on my BBQ outside than heat up my whole kitchen inside. I’m Chef by trade and I can already envision some real creative ideas coming out of the pizza oven. I can also see a pizza popping out of the oven every 10 – 15 minutes during one of my back yard parties. I am looking forward to checking out foodfornet for future gadgets, and let me tell you, I am all about kitchen gadgets. Thanks for a great addition to my BBQ. I’ve never heard of Kettle Pizza Grill … this is very interesting! I’m really glad you came up with the upgrades to improve the pizza quality, while all that does sound expensive, the benefits seem greater. I never thought of cooking pizza in a grill. Do you have any recipes? I’m wondering about the fuel… how much does it consume? What an interesting grilling contraption! I’ve heard of wood-smoked bacon and steak. But, pizza is certainly a new one. Just a question, I noticed that when you set up the KettlePizza, you mentioned the pizza stone. Where does that go? Is that placed above or below the charcoal basket? Don’t sweat the mistakes too much. If it’s good to eat then, your pizza was a success. Practice makes perfect if you want to cook the pizza evenly, sometimes the crust gets a bit burnt, or the cheese & vegetables dry up. The stone goes below the KettlePizza! Make sure to heat your stone WITH the KP. The hot stone is what bakes the bread. Great review! Like so many others, I also didn’t realize this was even a thing — Pizza on a grill? Although I’ve always been an avid camper and fan of the infamous “pudgie pie pizza” over the fire (If you’re familiar). So this is just a step up! I am a very visual learner so all of the images were spot on and by far the most informative part for me! This would definitely be a backyard favorite at any house party. Just to clarify, the pizza stone does not come with the KettlePizza kit, correct? I must say i enjoyed the read and thanks for a well written and much more detailed review of KettlePizz Weber Grill. I quite liked the upgraded stainless baking steel but my concern is the temperature variables. And what other color are available should one considering buying one for summer use? This KettlePizza Charcoal Grill Insert is something that I will definitely be buying this spring! I like the fact that it is affordable as compared to other wood-fired ovens, and restaurant-style pizza sounds amazing…! I see what you mean about setting it up correctly, but I will learn by following your photos, and make sure that the coal and the wood are at the back of the grill. My round, electric, Weber grill would be perfect for this, and I can’t wait to get started! Hm, I’m not sure if this will work with an electric grill. My guess is not! I’d double check with KettlePizza before buying. Wow I never would have thought to cook a pizza on a grill before, but I love the idea. Grilling season is pretty much here! So this is a great opportunity to buy it. It looks like it can be tough to put together by yourself so thank you for the oops you your part so I can learn! 🙂 Which one would you recommend for beginners? Ok, this thing HAS to come home with me. How brilliant! Your review was exceptionally well written and has a ton of information very helpful in making a decision to buy. My husband is a nut about BBQ’s, Smoker’s and anything Pizza Oven related and was pretty excited about the KettlePizza! Thanks for the info! A really great review and great pictures to go with it, quit a awesome bit of kit to have in the garden throughout the summer. Nether knew there was a portable grill that you could cook pizza on. A great alternative to your regular BBQ. I’ll be sure to let friends know about your review which i’m sure will end up getting one for themselves. The only concern is the amount of fuel you have to use to get the temp right plus does it come with any recipes and instructions for the beginner getting started ?. I love pizza! And would love to have it cooked in my garden 🙂 This insert looks very cool but the big flaw is the high amount of fuel needed to have the pizza properly cooked. Does it just seem to me or is the bottom of your pizza litlle bit burnt in the picture? Or is it within a tolerance? 🙂 Is it because of the not-spread charcoal as you mention in your article? You can bake the pizza any way you see fit, but a bit of “char” on the crust is very acceptable, and even desirable for this type of pizza. I love panned pizza in direct fire and this makes it much more easier. Even the design of the oven is really good to check while cooking. But I have one question though because I’ve seen you advising on a certain kind of wood to use, is it possible to use the normal chackle or any other kind of wood? Uhm, this is amazing! What a neat idea. I’m going to be buying this for my dad for his birthday. 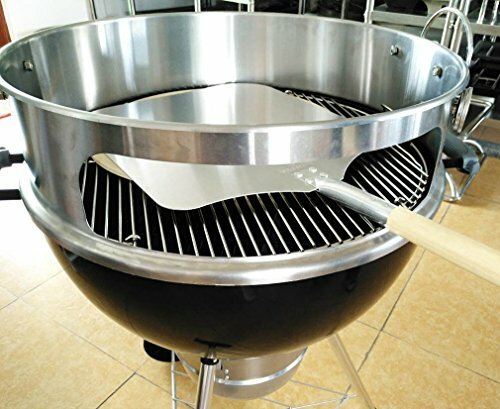 I would love to get one for myself, but my only issue is that I have a larger rectangular gas grill, not a small round one. Do you happen to know of any products that would work well with my grill? Thanks so much for sharing, I’m off to find some pizza! I love the look and concept of this device! I love homemade pizza but currently the only option I have is to crank up the oven all the way and hope for the best. This would be a huge improvement and more fun! 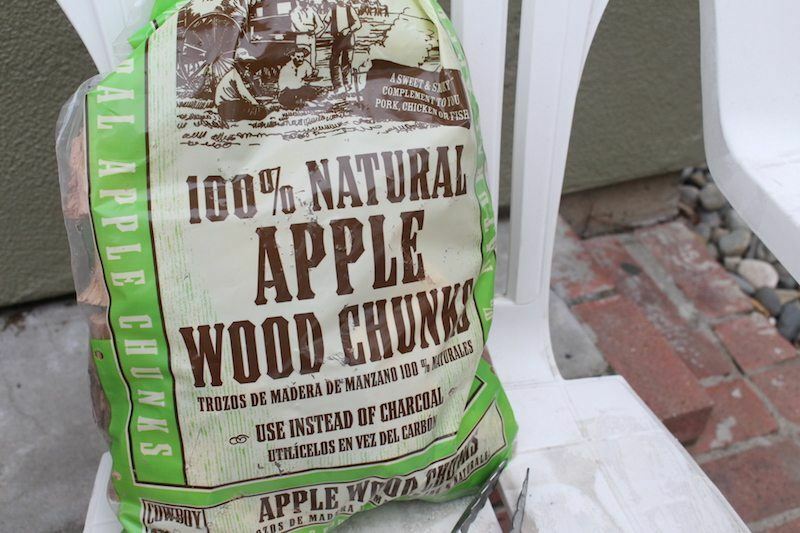 Have you tried other wood chip types besides the apple? Which do you like best? I also tried cherry and pecan. To be honest, I couldn’t really tell a difference in the flavor. But my “pizza sensors” are not 100% refined. Maybe after eating more pizzas I’ll be able to taste more of the flavor. But my advise is to just go with the cheapest wood you can find! I have clearly been out of the loop on upgrades for grilling. This is an awesome page, because I learned a lot about bbq’ing pizzas, and even though I have a small deck, I believe that I could live on bbq pizza all year round. Especially some of your creations like bacon and pineapple, to which I would add some of that brie. I am glad that you mentioned the learning curve. Since I am one of those people who tends to skip over some of the instructions for use, I would think that screw ups were strictly my fault. But this sounds like the kind of fun mistakes that make life worth living! Is it very easy to break the stone? And what is the pizza peel? I seemed to have missed that info, but I think I was distracted by all the yummy food pics on your page lol. Thank you for this awesome review! The pizza stone, if you get one specifically for grilling, is not that easy to crack. I’ve had mine up to 1000º and it was fine. I would definitely avoid putting a wet pizza stone onto the barbecue, and I also advise that you let the stone heat up WITH the barbecue at the same time. The peel you don’t have to worry about, it won’t get that hot! What a cool tool! I too have never seen or heard of a pizza barbecue grill! Your article is quite informative and entertaining. The pictures are very helpful so we can really visualize what your are describing. Do you happen to have any gluten free pizza dough recipes? Lot’s of folks are learning that they are gluten intolerant these days, (including myself) and so have eliminated pizza as an item in their diet, (including me). But who doesn’t love pizza with all their favorite toppings? It would be lots of fun to be able to fire up a grill in the back yard and cook a top notch delicious pizza. If you want to do a bit of editing, I did find a few tiny typo’s. Thanks for the in depth info, and well written too. Yes, I’ll start publishing gluten free pizza recipes in the next few days. Right now that links will go to an empty page, but between May 18 – June 10 pizza recipes will be added (they are in the queue to be published). Hi Nathaniell, just got through your unique recipes, gave me some good ideas. Unbelievable how handsome is your pizza from your kettlepizza weber grill. Just got through your blog too, it looks astonishing. I’m just starting mine and hope I’ll reach your level but from what I see, lots of work to do^^. This grill sounds great considering that you can cook a pizza in it. Is the grill heavy to pick up to relocate? I know that you mention the temperature about the front and back but does it cook evenly? I can see myself buying one because I like grill foods. I really enjoyed your review. It was comprehensive and thorough and provided all the information that was needed. I had never heard of this before but thanks to your great review, I just ordered one off Amazon. I am super excited to try it out. Thanks again for sharing and for the review because I never would have known about it if you hadn’t. I didn’t even know that there was a way to cook a pizza in a grill! 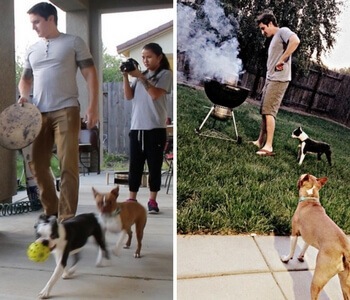 It seems a very practical idea and an alternative to barbecue days. I have a lot of friends that love pizza and i think this is something they need in their lives. Congratulations, that’s a very detailed review! 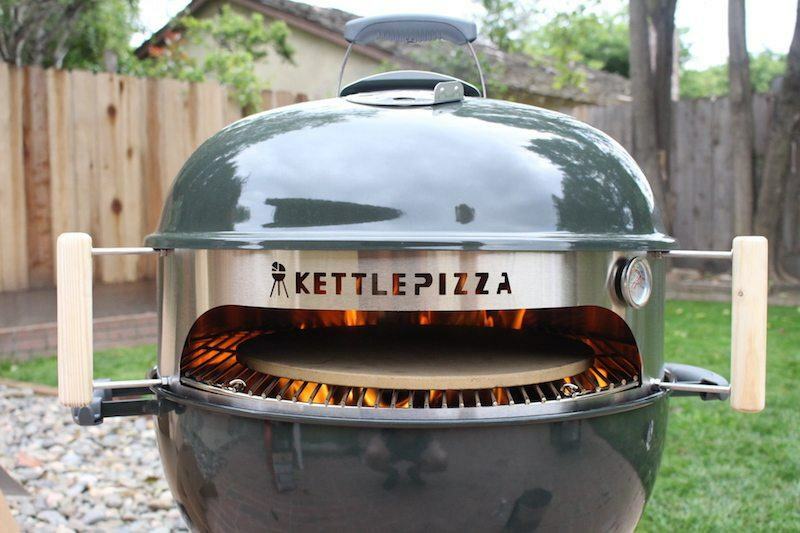 Hi Nathaniell, this was the first time I have seen this fantastic Kettle Pizza Weber Grill. This Kettle Pizza Grill I believe can be used to grill other food stuff too. The you tube video shown and demonstrated how few variety of pizza been grill and really acted as a support for this review. The question I wanted to ask is the support where the pizza laid on to grill, what was the material made from? It so flat and the shape like a stone to me. Wow, this is awesome! I love artisan wood-fired pizza, but it’s so expensive- this looks like a really great option for somebody with a grill at home. I really liked the product review, it was very comprehensive with excellent pictures and descriptions, and I like that you also added several competing grills to compare with. I don’t have a grill, but knowing that I can make pizza in my own back yard is definitely tempting me to get one! Wow! That certainly was a very though review. It covered everything from what style of wood chips / chunks to buy to how honest you were with the readers regarding early mistakes you made so we can avoid them. Thank you for being so passionate about your BBQ and wood fired pizzas. This article certainly helped me in regards to BBQ pizza accessories. Thank you. That is ingenious, ha! I could definitely use something like that. Good pizza is hard to come by in my opinion so something like this makes perfect sense. All of your directions brake it down for dummies like me to be able to use it as well. Last thing I’ll say is that picture of the finished pizza made me hungry and it’s now time for me to eat lunch. Cheers! I’ve been looking for something like this to put in my back garden. I never thought though you could buy kettle BBQs to cook pizza’s in, I am assuming that you can cook anything in this magical kettle dome lol. I wanted something that I could also use as a burner for cold nights as well as a BBQ and now I know I can make pizza in it I feel me and family are made. Great Review regarding the Pizza Insert. I found that I would like to have one of these and especially liked the detail and the video that the review provided. Thank you for providing the links on where I can purchase the product as well. Thank you for providing this information.